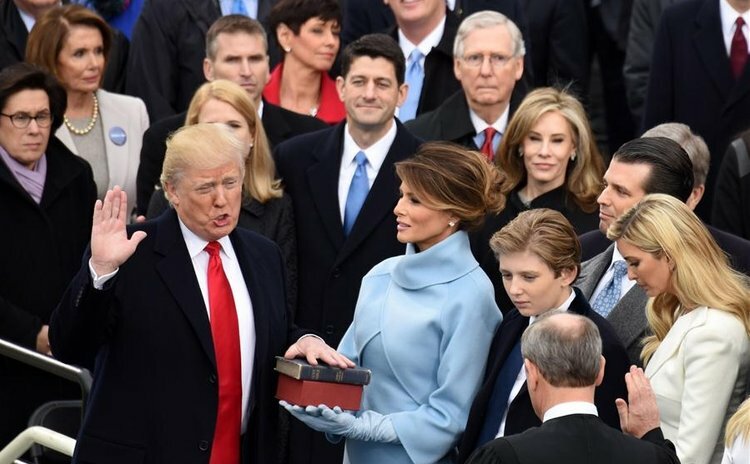 Our world entered a dangerous and uncertain era last week when Donald Trump took the oath of office, on Friday, to become the United States of America's 45th president. That event sent shivers down the spine of many people who have taken Trump at his word and have observed his erratic, moronic and egoistic actions and statements. Very Sad. When we read an op-ed by Charles M. Blow of the New York Times on Thursday last week, the day before the unthinkable -Trump as president- became reality, we shivered too. Blow writes that Trump could deliberately, or accidentally, ignite a nuclear war with China over the South China Sea's disputed land mass and on the issue of Taiwan, the basis for the One China policy. In the article entitled "Are You Not Alarmed?" Blow writes: "I continue to be astonished that not enough Americans are sufficiently alarmed and abashed by the dangerous idiocies that continue to usher forth from the mouth of the man who will on Friday be inaugurated as president of the United States. "Toss ideology out of the window. This is about democracy and fascism, war and peace, life and death. I wish that I could write those words with the callous commercialism with which some will no doubt read them, as overheated rhetoric simply designed to stir agitation, provoke controversy and garner clicks. But alas, they are not. These words are the sincere dispatches of an observer, writer and citizen who continues to see worrisome signs of a slide toward the exceedingly unimaginable by a man who is utterly unprepared". Blow continued: "Last week, Trump's secretary of state nominee, Rex Tillerson, said during his confirmation hearing that the United States had to "send China a clear signal that, first, the island-building stops(in the South China Sea), and second, your access to those islands also is not going to be allowed." And China responded. "Unless Washington plans to wage a large-scale war in the South China Sea, any other approaches to prevent Chinese access to the islands will be foolish," a spokesman said. But even if Trump, by threatening to push the South China Sea button, was just merely rolling up his sleeves to cut a deal with China, the new US president is likely to start a trade war with China that could escalate into a shootout, Blow suggests. And according to the article, China will fight over Taiwan if Trump walks over (he claims that the policy is negotiable) the One-China policy. "Chinese leaders will fight for it. They can't lose Taiwan", the op-ed suggests. Then Trump has entered into a strange relationship with Putin (who could even be blackmailing Trump, for all we know); he has also stated that NATO is obsolete and he has even started trash talking Angela Merkel of Germany, America's main ally. This guy that Americans selected as their 45th president appears to be as crazy as a drunken fowl. Since we in the Caribbean are an active part of the global network of trade and services, whatever Trump does, or fails to do, will have a profound influence on our way of life. We cannot, or should not, ignore Trump. In assessing the impact that a Trump administration may have on the region the Caribbean Council, a consultancy group, has identified five key policy areas where change is now likely under a Trump Administration. The first is Cuba-US relations that had just began thawing during the latter part of the Obama administration. "The contours of Cuba-US relations under President Trump have been subject to intense speculation, creating substantial uncertainty for regional governments and investors. Although he promised to roll back the rapprochement during his campaign, a number of factors suggest that President Trump may now moderate his stance," the CC suggests. "It is debatable whether there is any political capital to be gained from reversing the course set by President Obama. Secondly, Trump's position on trade is likely to have tremendous impact on the Caribbean. "Donald Trump's '7 Point Plan' to reformulate America's trade policy is principally focused on China and NAFTA, and will have unpredictable effects on the Caribbean," the CC predicts. "Stakeholders will be watching closely to see whether President Trump focuses his energies on symbolically significant trade agreements such as NAFTA, thereby leaving other regional trade arrangements such as DR-CAFTA and the Caribbean Basin Trade Partnership Act (CBTA) relatively untouched." Thirdly, on the issue of Venezuela, the Trump administration, the CC says the US is likely to be dragged into Venezuela's ongoing political and economic crisis, which could in turn lead the Trump Administration to engage more widely with the Caribbean region, given the role which Venezuela has played over the past decade as a major source of finance and development support to the region. Fourthly, on the issue of climate change Trump has vowed to step away from all international pacts that would bind the US to take action to save the planet. "Trump's campaign stance on climate change represents a significant threat to the Caribbean's vulnerable, low-lying small island states. In questioning the legitimacy of the Paris Agreement goals to limit warming to below 2 °C, and to increase financing for climate-resilient development, the Trump administration risks re-opening discussion on the long-negotiated and comprehensive agreement," the CC said. "With the Caribbean suffering from an increased frequency of severe weather events, the region will need to see action on a global scale to address climate change." Fifthly, Caribbean nationals who have made the US their home and who are living there illegally are likely to be scared by Trump's policy on immigration and security but the CC believes the "possibility of large scale deportations of undocumented Caribbean immigrants is overstated". One thing is certain: President Trump has had America, and the world, afraid again and Dominicans are advised to keep their eyes on him.